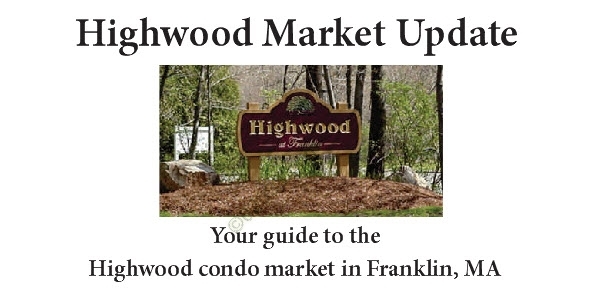 On the face of it, 2015 was a surprisingly down year for unit sales at the Highwood Condominiums in Franklin, MA. Sales volume fell sharply compared to 2014 while the average sale price at Highwood slipped for the first time in four years. But if you dig into the sales data, the results for 2015 really do not indicate a slump in demand for these condos. Read why below . 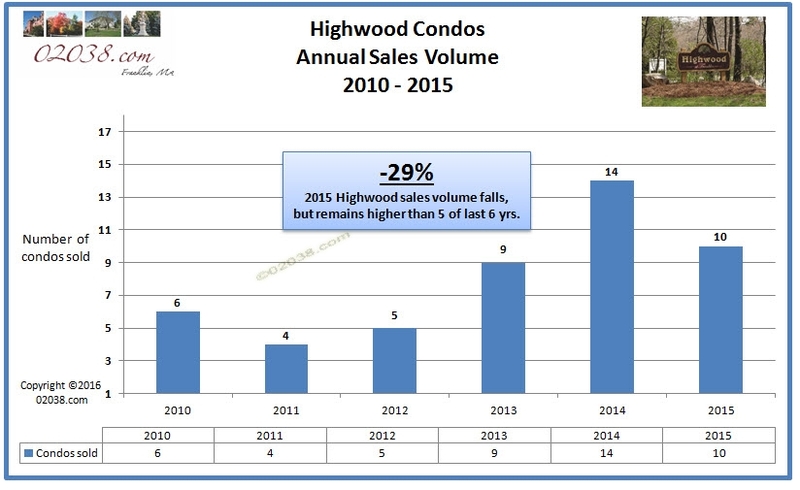 . .
For the year, Highwood sales volume fell 29%. However, the 10 sales that did take place during 2015 exceeded the annual sales totals at Highwood for several of the years prior to 2014. So in that context, unit sales at Highwood for 2015 were not all that shabby. 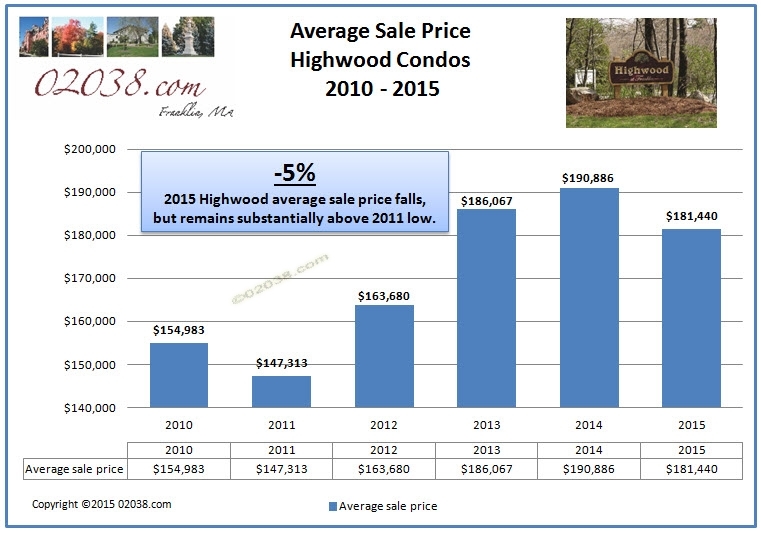 However, Highwood experienced in 2015 its first drop in annual average sale price in the last four years. The decline seems unexpected because 2015 was such a strong year for real estate in the Town of Franklin and the Commonwealth of Massachusetts as a whole. 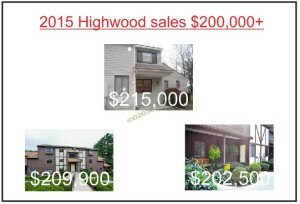 And there was no bad news specific to Highwood announced during the year that would account for such a price drop. So why the price slump? 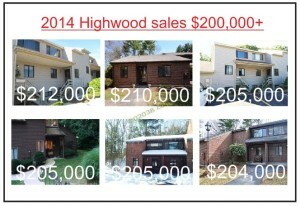 In 2014, there were six sales at Highwood above $200,000. In 2015, there were only three such over $200,000 transfers. 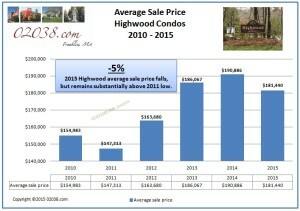 Because Highwood had so many high priced condo sales during 2014 compared to 2015, it’s a function of mathematics that 2015 would show a statistical drop in average sales! 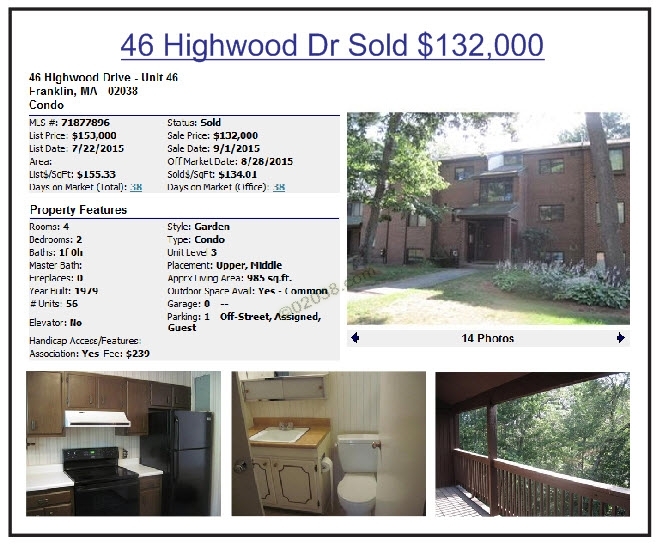 46 Highwood Drive was the lowest priced sale at the condo association during 2015. This one level “garden” style unit was vacant and needed extensive updating. In fact, the photos above make the interior look better than it was in person! That is why the selling price was so low. 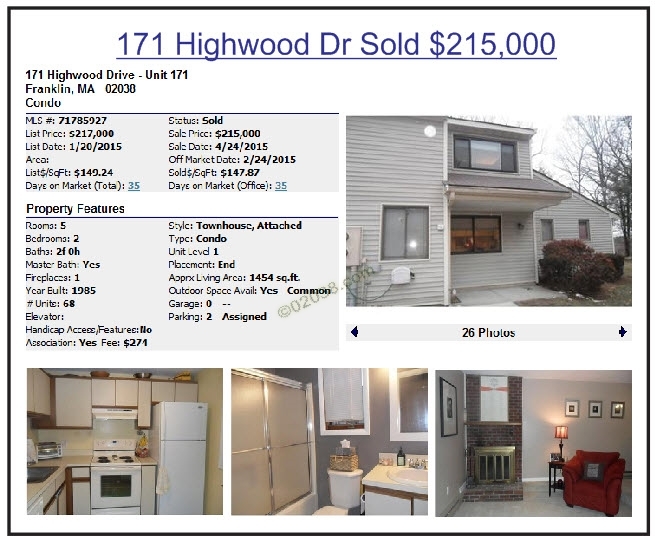 At the other end of the price spectrum for 2015 was 171 Highwood Drive. This two level townhome offered two bedrooms and two full baths. The kitchen cabinets were original to the unit. At $217,000 this was the highest priced sale at Highwood for the last two years. Again, condo prices did not drop in real terms at Highwood for 2015 – the average sale price was down for the year only due to a quirk of statistics! Highwood is a large condo community that offers several floor plans at affordable prices. These condos meet the needs of a wide variety of buyers, making Highwood one of the key condo alternatives in Franklin open to all age groups. 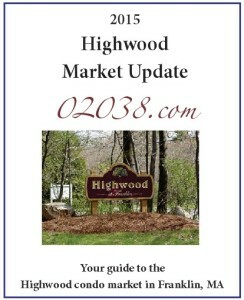 If you have any questions about Highwood, ask Warren! Buying or selling, he’s a great resource for Highwood!